For the rest of our present season the members of the Fermoy Toastmasters Club can look forward to gathering in the Board Room of the Grand Hotel with its pleasant lighting and warm genial décor where we gathered on Tuesday, March 18th for our latest meeting. Welcomed by our Club President Jerry Hennessy, control of the meeting was passed to veteran member Kevin Walsh who chaired the proceedings for the evening. Having greeted the members and guests and announced the details of the programme, he then read out the apologies from those few members who were not able to join us on the night but who wanted us to know that their hearts, support and goodwill are still with the club which is always so very gratifying and encouraging. The striking of the gavel against the sounding block marks the beginning and conclusion of every meeting as well as the passing of control at the appropriate moment between the members of the top table panel consisting of President, Toastmaster and Topicsmaster. Every meeting is a circle which begins and ends in the hands of the Club President. At first sight it may seem a relatively unchallenging role with the holder passively surveying everything with the chain of office representing continuity and tradition resting easily on their shoulders. In reality however, the President is at the very centre of the club’s life and mission setting the keynote for every meeting throughout the entire season from September to May, ensuring that club affairs progress smoothly and above all that everyone is feeling happy and enjoying their membership and participation by being approachable, friendly and encouraging. When people are at their happiest, they give of their best. With Jerry, we have a truly outstanding President in the very finest tradition who brings such natural warmth, grace and kindness to his office so that all of our gatherings are marked by mutual support, conviviality and the generosity of spirit of friends together enjoying each other’s company. Kieran Connolly gave us a stimulating and vibrant topics session with an eclectic range of themes such as the great era in Irish rugby coming to an end with the retirement of Brian O’Driscoll, the proposed insurance levy for flood victims, the opt out from religious education in the schools and the effectiveness of electric cars, which drew a number of very interesting contributions from the meeting, especially John Sherlock who drew attention to the prohibitively high cost of these vehicles and their very limited mileage range. This was underlined by Mary Murphy who recalled travelling in an electric car on the hilly coastal road between Dungarvan and Tramore on a cold winter’s day with the heating switched on that so rapidly drained all charge from the battery that the car slowed to a mere crawl and a relatively short journey took several hours. Such sluggish motoring performance is in stark contrast to the electrifying enthusiasm that is generated by a lively, engaging topics session, which fills a meeting with the zest of spontaneity. Initial responses are limited to two minutes and add-ons of just one minute each which keeps everything sharp, clearly focussed and to the point, building a great atmosphere and getting everyone fully active and involved with eagerness of mind and swiftness of word. We then enjoyed three outstanding prepared speeches beginning with one of our recently-joined members, Daniel Mullins, with an illuminating presentation under the title of ‘Not So Quiet On The Eastern Front’ that took us on a very informative journey through the complexities of the unfolding Ukrainian crisis and the Russian annexation of the Crimea, setting it fully in its historical context and exploring the recent momentous events that have revived something of the tensions of the Cold War era except now it is no longer an ideological quarrel but more to do with Great Power rivalry about spheres of influence and the control of strategic territory and natural resources. It was a very thoughtful and well researched contribution from Daniel succinctly weaving together many strands of fact and identity, blending history with current affairs and leading us to a deeper understanding of what lies behind this great crisis. Another of our newly-joined members, James Keating, then brought us the Golden Age of Television. Not the pioneering black-and-white era that I fondly recall, but the great present day flowering of drama in all of its immense richness, citing among so much else some of his personal favourites such as the gangster series The Sopranos, the portrayal of the American involvement in World War II in Band Of Brothers and the currently showing Vikings series that brings a tumultuous era from the distant past so grippingly back to life. Having worked in New York at the time of 9/ 11, James powerfully felt the historical resonance of the era depicted in Band Of Brothers when he told of seeing there a huge aircraft carrier with its jet fighters taking off and landing protecting the city from any further attacks. Finally, we were taken from the turmoil of the early 21st century with a speech entitled No Cross, No Crown by Michael Sheehan back to the era of William Penn of Macroom who some three centuries ago was to found the colony of Pennsylvania and the city of Philadelphia as a haven of tolerance and acceptance in the New World for the much-oppressed Quaker community and for all who yearned for the freedom to live and believe as they wished. It was a fascinating and very well-told story that has an enduring relevance for all ages. Our club meeting of Tuesday, February 4th, had regrettably to be cancelled because of very severe stormy weather. This decision was greeted with sadness but also a mature acceptance that the safety of our people is quite rightly our uppermost concern. In well over forty years, the number of times when adverse conditions have forced us to call off our meetings can be counted on the fingers of one hand. Considering that the winter months make up the greater part of our season, this is a very fine and proud record. It is with all the greater pleasure and eager anticipation that we look forward to our next gathering at the Grand Hotel, Fermoy, that will be held on Tuesday evening next, the 18th, at 8.15 pm. The programme for the cancelled meeting of the 4th will form the basis of the proceedings at our next gathering on the 18th. No one will be left out or disappointed. No storm can blow out the sun or hinder the mission and goals and the great shared enjoyment that is the life of our club. Storms pass but words of beauty, thoughts fashioned in generosity of spirit, sentiments expressed with sparkling verve and drawn from the richness of the human spirit, these things tell of the enjoyment of life and cannot be quenched or stifled. And if some days we cannot go forward with flags unfurled, then we must proceed quietly, with hope and dauntless optimism, to the next meeting, facing the next challenge, coming together with friends to share our joy in what we do and the happiness of being together promoting the arts of communication and leadership. For all of its many faults, this is still is such a beautiful and fascinating world. And there are few places where that joy of life can be better celebrated than at a Toastmasters meeting. This is because at the very core of our activities is the broadening of horizons and the attainment of personal growth through speaking, listening, understanding and enjoying everything along the way. Everyone comes initially to gain and are then surprised by how much they have to give. For all of us are engaged in building and furthering each other to ever greater heights of achievement in a spirit of mutual support help and the delight of good company. None of us can ever have too many friends. And as friends together we enable each other to be most fully ourselves by utilising our talents and potential to the very optimum in a way that is not about deadlines or pressure, but about everyone having a good and congenial time together through the path of entertainment and humour. That way everyone can rise to and give of their very best as individuals but in a way that no individual on their own could ever do for themselves. Good companionship is one of life’s richest blessings and in Toastmasters you find it in abundance. We all rejoice in the company of those we have known in the club for a long time while broadened and stimulated by the wonderful experience of getting to know new and different people who come to us first as guests and then later as fully participating members. Participation is what makes Toastmasters so very special and unique. This is not a lecture hall where one or two individuals hold the limelight for themselves and others just passively listen. In Toastmasters, everyone gets their turn and all have their opportunity to take part whether as set speakers, as evaluators and givers of positive feedback to the speakers or by contributing to the effervescent unscripted spontaneity of the topics session. No one is left out, every member is equally valued and cherished by all of us in this happiest of amicable circles. None are left to congeal and ossify into inactivity. Our activities are always bracing and invigorating, a vivid betterment and elevation of reality that everyone takes away with them after the meeting is over to carry over and to enhance all aspects of our lives. Then two weeks later we gather again to pool our shared resources of creativity and energy, our insights and talents and ideas to fashion something that is so refreshing and uplifting and which brings a degree of fulfilment and satisfaction that is hard to find elsewhere. We are not actors uttering the lines of others, but merely being ourselves and speaking with a voice uniquely and truly our own. In these winter months we have all become far too familiar with the roar of passing storms. But there is no sound in all the world to compare to the beauty of the human voice and the spoken word, with the depth of meaning, the subtlety, the richness of word and ideal and sentiment that it alone can convey. For no two people ever think the same about anything or look at life in exactly the same way just as no two people will ever perform the same task in the same fashion. Everyone is different and has something to offer that no one else can. Toastmasters are a wonderful forum to explore and to express and to celebrate this marvellous human diversity and richness that is so engaging and enjoyable, so pleasant and pleasurable, so bracing and exciting. We are open to all and embrace all possibilities of renewal and personal discovery. In speeches, topics and evaluations, someone will always give you an insight or a way of looking at some aspect of life that you had previously never considered just as each of us in our own way have something to contribute that is completely and entirely of ourselves as the people that we are. So when the storms have finally passed, it is the words spoken with conviction and hope, with goodness of feeling, breadth of imagination and clarity of thought that remain with you always bringing illumination and wisdom and strength of character with a delightful warmth and gladness of heart. The roaring gale is forgotten sooner rather than later but the gentle word of beautiful truth and depth lodges forever in the memory and brings forth the joy of inner springtime. There is only one way to discover the joy and rewards of Toastmasters and that is to come to one of our meetings. So we look forward to welcoming as many as possible to our next gathering on the evening of Tuesday next, February 18th, at 8.15 pm in the Grand Hotel, Fermoy. For further information, please contact Fanahan Colbert at 086 8239007 or Kevin Walsh at 058 60100 or log on to toastmastersfermoy.com. The essence of the art of Toastmasters is the constructive use of time. You can go around shopping centres without catching glimpse of a clock anywhere – presumably they want to induce that sense of timeless unreality surrounded by a consumerist abundance that makes it easier for the customer to part with their cash. But in Toastmasters we understand that to utilise the time we have to the very fullest brings out the very best in everyone. 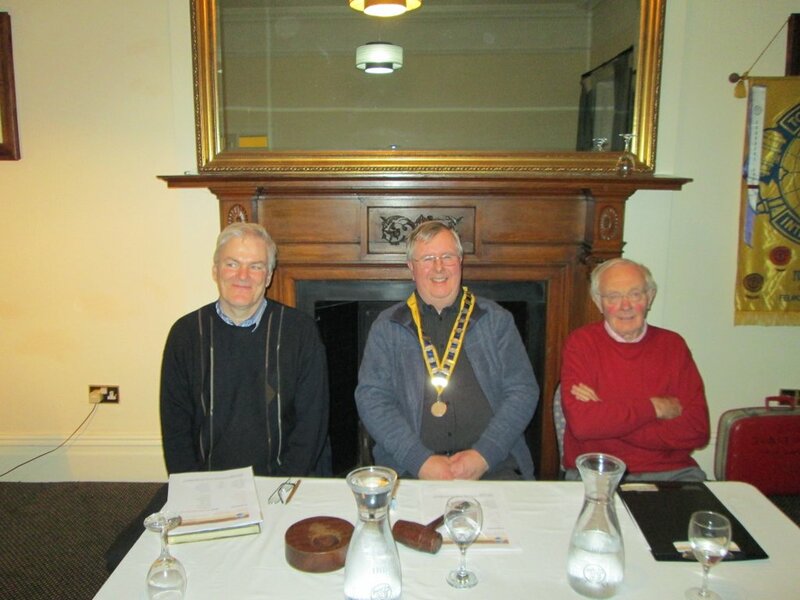 Kieran Connolly (left), Toastmaster of the evening, takes a sideways glance at the top table with Jerry Hennessy, President, and John Quirke, (right), Topicsmaster who having joined in 1978, is the longest serving member of Fermoy Club. All pictured here at the second meeting of 2014. This was underscored at the outset of our most recent lovely meeting on the evening of Tuesday, January 21st, in the Grand Hotel by Toastmaster or chairman of the evening, Kieran Connolly, who before performing any other function, introduced by our timekeeper, Frank O’Driscoll, sitting at the bay window, controlling the lights and on cue to ring the bell during the topics session. This is not to induce an anxiety about time but rather to emphasise how much we can say and do and achieve and the enjoyment we can have with brevity and precision and clarity of thought and expression. This essential discipline ensures the lightness and vitality of all of our meetings, managing time in such an effective and balanced way that everyone is given their say and allowed their opportunity to contribute but where no one can monopolise things for themselves. It is the guarantee of fairness, variety and zest that brings personal development and ever great fulfilment. We were all delighted to welcome back John Quirke from his recent time away and once again we were treated to a wonderful topics session on themes and issues that got everyone thinking, speaking and taking part, all feeling stimulated and enlivened by the eager pleasure of participation. In two bracing topics sessions, we encompassed such subjects as the use of windmills for power generation to the educated guesswork that is long-range weather forecasting, from the quietness of meditation to the ringing quote from George Bernard Shaw who described Ireland as a prison run by the inmates. Here we had everyone getting involved and offering their own ideas and insights on the great and small issues of the day. It is not a debate but rather a sharing of originality of mind and freshness of understanding with the whole meeting, giving everyone something to think about and to take away with them after the meeting is over. Now an essential feature of any Toastmasters meeting is the halfway tea break when everyone goes to the hotel lobby and relaxes with a steaming cuppa and biscuits for a pleasant and affable chat. This is outside the formal proceedings but yet it is such a huge part of it. For it is a genial interlude and a time of ease, celebrating the pleasures of friendship and conviviality, of social grace and good chat all of which serves to broaden every smile and bring added light and warmth to every heart. 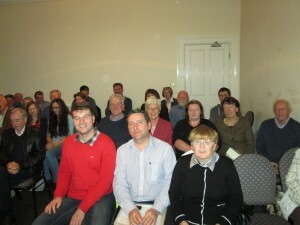 There is no greater celebration of the beauty of the spoken word than stimulating and pleasant conversation and no nicer or better people with which to share this pleasure than the affable, genial and most amiable members of the Fermoy Toastmasters Club at their fortnightly gatherings that illuminate our evenings and enhance our lives in the months between September and May every year. 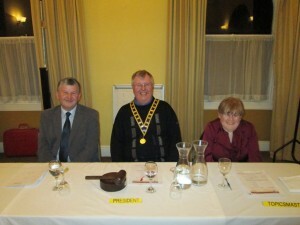 Our meeting was graced by four truly remarkable and fine speeches. Mairead Barry with her warmth of heart and great enthusiasm for knowledge and for life once again brought us to a long neglected subject by telling us something of the life of a very distinguished Fermoy lady, Josephine McNeil, who enjoyed a brilliant diplomatic career, serving as Ireland’s first female ambassador in a variety of major overseas postings. Johanna Hegarty offered what the advanced manual stipulated as a presentation with self-deprecating humour by telling us of a number of hilarious anecdotes of her time working in the pathology laboratory of a major hospital. 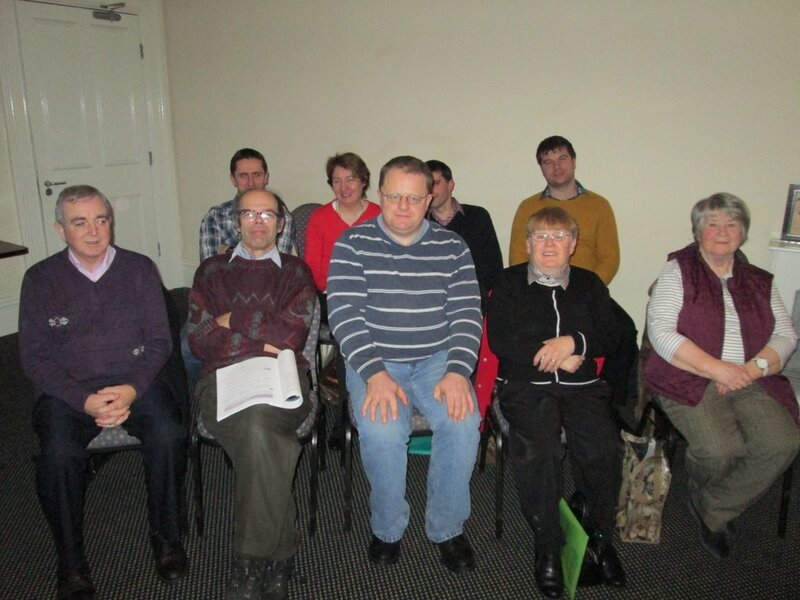 Members enjoying a meeting of Fermoy Toastmasters in early 2014. Oliver Reilly reminisced of his days working machinery in London in the early 1970s and encountering some rather unusual characters in an ex-servicemen’s care facility in Richmond where one putative pugnacious war hero turned out to have been injured in nothing more adventurous than falling on an icy pavement. James Keating related of love of adventure on the high seas in the style of Master And Commander and finding just that by embarking on the Irish sail-training ship Asgard II which sank off the French coast after having struck a submerged container: a gripping adventure and a lucky escape which we were privileged to share with one of our most welcome new members. And then the evaluations from John Sherlock, Fanahan Colbert, Eilish Ni Bhriain and John Kelly, with a final overall summation by general evaluator David Walsh, who praised the speakers and the participants for all they had done to weave the rich tapestry of yet another memorable evening of speaking, listening and broadening of mind with quickened interest and flashes of great humour. We can all go down to the sea of life in ships of fine words and well-crafted speeches that are a vivid and engaging delight to listen to. And so our voyage of discovery continues as we look forward to our first meeting of the second meeting of the New Year on Tuesday next, February 4th, at the Grand Hotel, Fermoy. For further information, please contact Fanahan Colbert at 086 8239007 or Kevin Walsh at 058 60100 or log on to toastmastersfermoy.com. 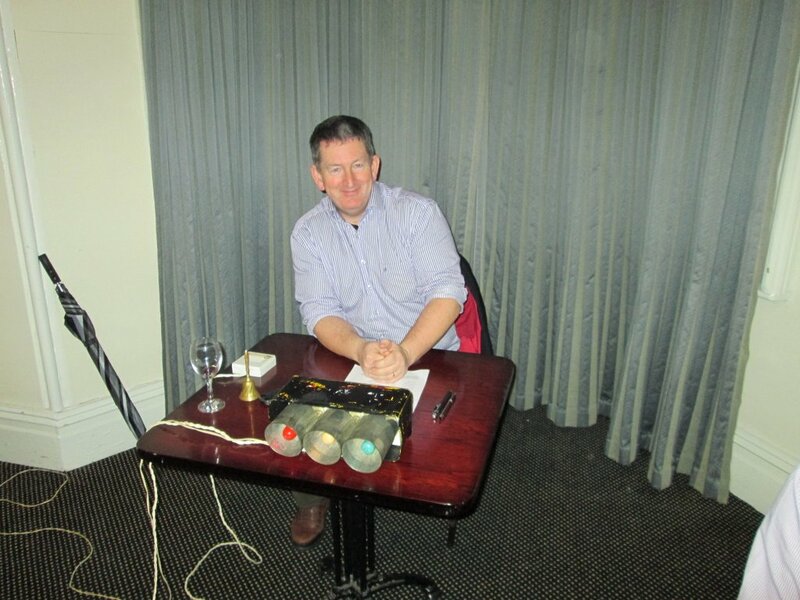 Keeping an eye on time with the lights is Frank O’Driscoll as Timekeeper at meeting January 21st 2014. It was good to be back was the universal sentiment shared by everybody at the first meeting of the New Year of Fermoy Toastmasters held at the Grand Hotel on the evening of Tuesday, January 7th. Our President, Jerry Hennessy, extended cordial greetings and a very warm welcome to all, voicing good wishes for a full and speedy recovery to a few of our members currently unwell and unable to join us but looking forward to seeing them very soon again. Control of the meeting was passed to our Toastmaster or chairman of the evening, Frank O’Driscoll, who with his affable smile and engaging charm, kindness and humour, carried the proceedings forward with confident ease and assurance. Having expressed the hope that all had enjoyed the recent Christmas festivities, he immediately struck an upbeat and strikingly optimistic note by asserting that in coming together for our meeting we were carrying forward a huge and unique local tradition of recreation, pleasure, personal growth and betterment of life not only for ourselves but for others to enter into and in their turn to build on and enhance in the years and decades ahead. It is the same wonderful spirit and character that drives our cherished club which has driven it forward these past four and a half decades, with such eagerness and creativity that is forever vibrant and young. Because what we are doing today in the footsteps of those who have gone before us and as we hope so many more will follow long into the future, is the celebration of all that is best in life, about being among friends, raising the music of laughter, affirming individual uniqueness in a setting where we all have so much to give to and receive from each other and the thrill of doing something unique, original and different every time, giving everyone a voice so that all might be good listeners. Those qualities were amply and wonderfully displayed in our topics session when our Educational Vice President, Mary Whelan, now acting as topicsmaster, was faced with the challenge of keeping the session going that bit longer then usual as one of our planned three set speakers for later on was unable to make it. She rose to this challenge quite magnificently and inspired the entire meeting to do the same, displaying that lively spirit of wanting to take part, to contribute generously with spontaneity and enthusiasm that is at the heart of all that we do. With her gentle style and grace, Mary presented a stimulating variety of themes that got everyone thinking on their feet with quickness of mind and response. Ranging from highlights of the Christmas holidays, to coping without electricity during the storms which prompted one member to tell us of individuals who could not go to church because with a power failure found themselves trapped in their homes unable to open their electric gates! Our President spoke of the pleasures of sitting by candlelight and the rediscovery of the beautiful lost art of conversation. The theme of the starting of another year being an opportunity to set things right, drew from John Kelly the wry observation that some people believe themselves to be so perfect that they think they get it right all the time. Among many issues touched upon were unwanted gifts, the wrong that is the telling of lies and the woman who gave up the security of the teaching profession to embrace her dream of being a chef. All of this made for a truly effervescent gathering, with everyone taking part and sharing something valuable and insightful, challenging and entertaining us, just the very uplifting tonic that was needed in the drab early days of the immediate post-Christmas period with this invigorating freshness and sense of renewal. Frank O’Driscoll then spoke of his special pleasure in welcoming an Icebreaker speaker to the lectern to deliver his first ever speech to the club. There stepped forward our newest member, Daniel Mullins who spoke very tellingly of the contrast between the prospects facing a graduate of today like himself as compared to a decade ago. But he saw in this no reason for pessimism, but rather struck a bright upbeat note in the pursuit of every opportunity for personal self-development and growth to add and enhance in every way possible to what he called his jigsaw of life. Daniel’s speech was delivered with conviction and in a very thoughtful way that struck a most receptive chord with his listeners who now warmly and most cordially welcome him to our circle of enjoyment and mutual good fellowship and wish him every success and happiness as member and friend. In Daniel we heard the spirit of young Ireland expressing itself, articulate and resilient, humane and generous, determined to build a rewarding and fulfilling life in this country. His message was one of hope and optimism that gave ample food for thought and great encouragement. Then too we had a really excellent Stage Four speech from Mary Murphy who evoked a delightful chapter in her life when she and her husband and family embarked for a number of years on annual motoring holidays to France in their somewhat basic but ever so cherished 81 WD camper van called Jenny that was a celebration on wheels of the spirit of freedom and adventure. Listening to Mary’s very well-crafted talk, we were all taken up on this journey of the imagination and travelled with her right across the most refined and cultured society in Europe. There was a sense of fun and eagerness about it all; of casting aside life’s cares and responsibilities for a few weeks every August and just going wherever the mood takes and enjoying the day and the moment to the full. Of course, today Jenny is a collection of rose-tinted memories, the kind that always warm and cheer the heart as Mary so well did in her beautiful speech. Our speakers then received positive and encouraging feedback and assessment from our evaluators Johanna Hegarty and Michael Sheehan, with a very fine overview of the entire meeting with a sense of what had been learned, enjoyed and achieved from our general evaluator, Fanahan Colbert. Learning, enjoyment and achievement form the essence of everything we are and all of what we do. Why not come to listen and see for yourself at our next meeting on this coming Tuesday, January 21st, at 8.15 pm in the Grand Hotel, Fermoy. For further information, please contact Fanahan Colbert at 086 8239007 or Kevin Walsh at 058 60100 or log on to toastmastersfermoy.com. 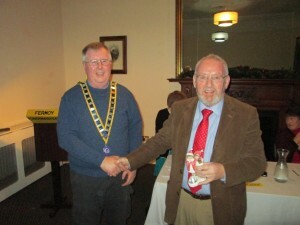 Our President Jerry Hennessy and the members of the Fermoy Toastmasters Club extend warm New Year greetings and good wishes to all of our many friends and supporters and look forward to another very promising season of meetings beginning on Tuesday evening next, January 7th, at 8.15 pm in the Grand Hotel, Fermoy. This will be our first meeting after the month-long Christmas break. 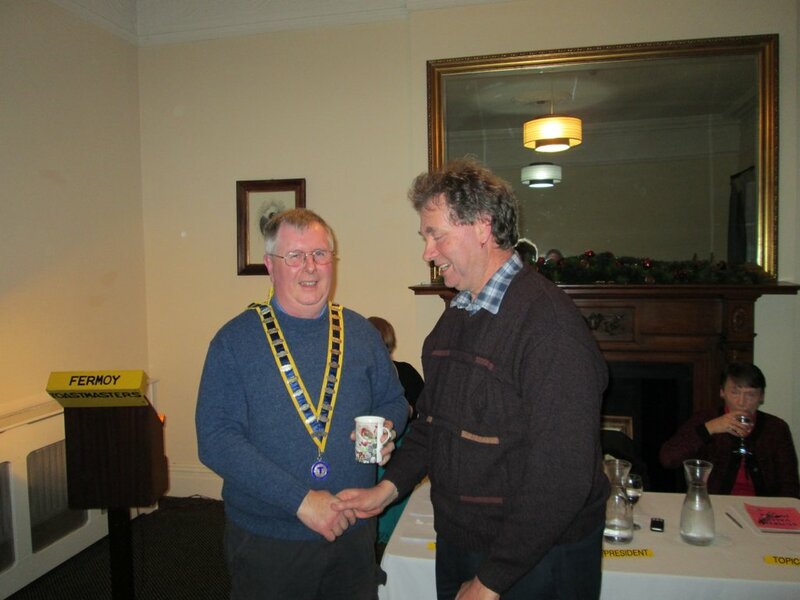 2013 was a very successful year for the club which was celebrated with a memorably pleasant and enjoyable festive gathering on December 10th when we held our annual Tall Tales contest that was won with style and aplomb by John Sherlock. This was followed by hospitality and refreshments where everyone added to the joy of the occasion in music and song, the recitation of favourite poems both comic and poignant all blended so effectively together with that entirely spontaneous magic of friends rejoicing in each other’s company. We are a fun group of people, warm, relaxed and welcoming; our club is a forum where everyone can be themselves bringing together the very best that we each have to offer in a vibrant and enriching affirmation of the joy of life. We have turned the corner of the year. On the recent winter solstice, for the first time in some six years since just before the terrible financial crash, the light of sunrise reached right into the very heart of the Neolithic mound at Newgrange in Co Meath. May it be an optimistic and hopeful portent of brighter and better days for this country and for us all after the trials and difficulties of recent times. 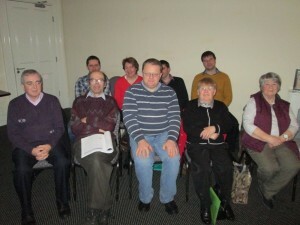 And in that same positive and confident spirit, Fermoy Toastmasters sets out once more on our shared journey to new beginnings and fresh achievement, encouraging the arts of communication and understanding, firing the imagination and warming the hearts of everyone, bringing together the creativity and energy of friends making lives happier and better in every way. It is almost forty-five years now since the late Niall Brunicardi and Padraig O’Braoin first established a Toastmasters Club in Fermoy. It is now the third longest established club in the country. That the town and community have built and sustained this great club across that span of time is indeed a great and remarkable achievement. In 1970 there were plenty of dark clouds in the sky: war was still raging in Vietnam, conflict had broken out in Northern Ireland and the banks were shut for a six month strike. There were lots of reasons for people to feel worried and apprehensive, offering plenty of excuses for sitting tight and doing nothing. But that has never been the outlook of those who carry such vision and imagination in their hearts and who believe that life can be made better, that we all have within us the capacity to reach ever higher and that no matter what there is always opportunity for enjoyment and personal growth. And so it is that while wars and conflicts burn themselves out; while the faces may have changed over time, the animating generosity of spirit is always the same. For two hours every two weeks on the banks of the River Blackwater in Fermoy, the Toastmasters are still holding lively, stimulating and entertaining meetings. To rise to the task and meet the most agreeable of challenge in a heady and engaging mixture of speaking, thinking and listening enriches the personality and broadens and warms the heart. To widen our horizons, to stimulate the powers of thought and expression, to share the immense pleasure of interaction with our fellow members and friends in a most genial and convivial atmosphere towards a better and more rewarding life are the real and lasting fruits of participation. In making a brief impromptu reply to a topic that comes our way is a powerful and illuminating stimulus to the mind. By going to the lectern to make a short but well-crafted speech is a source of great satisfaction that allows everyone to take something away and reflect upon long after the meeting is over. Moreover to listen with true discernment to the contribution of someone else and offer a thoughtful, helpful and positive assessment of same helps us find an added richness within ourselves. All along the way there is such a great spirit of eagerness and spontaneity, of humour, laughter and shared goodwill, carrying us forward in the coming months as it has all those who have graced and participated in this wonderful club in four and a half decades. That journey is endless and is open to everyone with the willingness to give it a go. When we believe in ourselves we will be believed in by all. 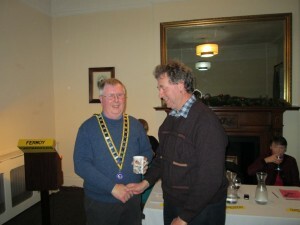 The outset of another year is the ideal moment to set out on a new personal journey of discovery and there is no better way of doing that than by coming to the first meeting of the Fermoy Toastmasters where all are so cordially welcome on Tuesday evening next, January 7th, in the Grand Hotel, Fermoy, at 8,15 pm. For further information, please contact Fanahan Colbert at 086 8239007 or Kevin Walsh at 058 60100 or log on to toastmastersfermoy.com. The meeting of the Fermoy Club on Tuesday, November 12th, was one of the very best and most entertaining to which I have ever been. A great and memorable night of fun and enjoyment and illumination with all of us expanding our horizons by sharing in something that we love doing, finding out something new about ourselves every time and pooling our creative energies and talents, wisdom, insights and humour to make such a very happy occasion. Our Club President, Jerry Hennessy, calls the meeting to order and bids fond welcome to so very many dear friends as well as new members and welcome guests who have come to join us for an evening of brilliant atmosphere that is truly inspirational. On his shoulders he wears the chain of office with pride and dignity, that powerful symbol of continuity with an accomplished past of more than four decades adorned with the names of all his predecessors in a tradition of promoting personal growth and enhancement of life for all members and participants that stretches far into an endless future. Every meeting is a celebration of life and about going forward in a spirit of optimism and hope. This is never a game of solitaire, for the glory of the craft of Toastmasters is that we can only give of our very best as individuals by working together in mutual support and encouragement. Each has their own unique voice and gets their chance to speak – the meeting gathers to listen to what we all have to say. Fresh ideas and personal renewal are brought forward by taking a full and active part in all the club’s activities. We all need constantly to learn and improve by receiving positive feedback and support, and here the club supplies the ideal self-learning environment where we are all joined together for our enjoyment and to the making of better life. Our toastmaster or chairman of the meeting, Oliver O’Reilly, with his ever pleasant and relaxed style guided proceedings seamlessly along and fostered a conductive atmosphere for an outstanding topics session from Frank O’Driscoll who once again proved himself such a great master of the art of getting people to speak impromptu. It’s not so much what you do but the way that you do it. Frank went to the lectern and straightaway proved that the spoken word is not the only direct means of communication between people, for you can say so much that is kind and generous and beautiful in a warm, friendly smile that comes from the heart as he brilliantly did that night. In his easy and affable manner, Frank presented to the meeting a range of topics humorous and yet subtly thought-provoking with a winning lightness of touch that elicited a huge and varied response from the audience, with a record number of add-ons so full of zest and enthusiasm – subjects ranging from the poor we shall always have with us while the broke still have hope; to the issue of how do you relax; the ultimate Nanny State spend in the UK of £200 to encourage mothers to breast feed; the man in a Dublin pub who reportedly swung a crutch at Bertie Ahern and the delights of the great personal ritual that is shaving. These and so much more had everyone thinking, speaking and contributing, their minds racing ahead with uplifting ideas and expansive sentiments, peals of laughter resonating around the room, making for perhaps the liveliest, the most animated and very best topics session we have ever had. The effervescence and often comic nature of the topics session was well-balanced by three set speeches that touched on the more serious side of life, but in all cases in a positive and hopeful way. Mairead Barry read from an essay by early African-American civil rights activist Belle Hooks describing the role of women in the struggle for freedom against discrimination and oppression by building homes of security and warmth for themselves and their children where they could dream of being free, imparting the wisdom of life and a sense of values that insists on rights and respect. Read with grace and conviction, this was a fine and very illuminating presentation from Mairead who always takes us to somewhere rather unexpected and vividly compelling. Eilish Ni Bhriain told us with compassion of an Irish family whose son emigrated to Australia, leaving behind hardship and difficulty, to make a new and far better life and whose expected homecoming visit some years later was awaited and looked forward to by everyone with great joy and anticipation which turned to dismay and trauma when the news broke of a fatal air crash from which nothing could survive except the healing promise of undying love. Finally, Kevin Walsh spoke on an aptly chosen theme of war and remembrance evoking the memories of the veterans of the Great War and their example of heroism and self-sacrifice, then carrying forward to the more recent savage conflict in Northern Ireland, of the witness of forgiveness offered by the late Gordon Wilson pointing the way to the building of a civilisation of goodness which reminded us that eventually hatred and bitterness gives way to the timeless power of the human soul yearning for peace. All of these speeches were so astutely and well evaluated by David Walsh, John Quirke and Kieran Connolly, with a very fine and all-encompassing overall assessment from our general evaluator, Joanna Hegarty. Believe it or not, but our next meeting will be the penultimate of the current pre-Christmas season. This is a wonderful time to share in the happiness and cheer of Toastmasters by coming to our next meeting on Tuesday evening next, November 26th, in the Grand Hotel, Fermoy, at 8.15 pm. For further information, please contact Fanahan Colbert at 086 8239007 or Kevin Walsh at 058 60100 or log on to toastmastersfermoy.com.